These FULL MOON rides are absolutely STUNNING! We have an abundance of wildlife on our trails and don’t forget to watch for shooting stars! Reserve in advance to guarantee availability! This is a 90 minute ride leaving at dusk (or prior). •Full Wolf Moon – January Amid the cold and deep snows of midwinter, the wolf packs howled hungrily outside Indian villages. Thus, the name for January’s full Moon. Sometimes it was also referred to as the Old Moon, or the Moon After Yule. Some called it the Full Snow Moon, but most tribes applied that name to the next Moon. •Full Snow Moon – February Since the heaviest snow usually falls during this month, native tribes of the north and east most often called February’s full Moon the Full Snow Moon. Some tribes also referred to this Moon as the Full Hunger Moon, since harsh weather conditions in their areas made hunting very difficult. •Full Worm – March As the temperature begins to warm and the ground begins to thaw, earthworm casts appear, heralding the return of the robins. The more northern tribes knew this Moon as the Full Crow Moon, when the cawing of crows signaled the end of winter; or the Full Crust Moon, because the snow cover becomes crusted from thawing by day and freezing at night. The Full Sap Moon, marking the time of tapping maple trees, is another variation. To the settlers, it was also known as the Lenten Moon, and was considered to be the last full Moon of winter. •Full Strawberry Moon – June This name was universal to every Algonquin tribe. However, in Europe they called it the Rose Moon. Also because the relatively short season for harvesting strawberries comes each year during the month of June . . . so the full Moon that occurs during that month was christened for the strawberry! •Full Sturgeon Moon – July The fishing tribes are given credit for the naming of this Moon, since sturgeon, a large fish of the Great Lakes and other major bodies of water, were most readily caught during this month. A few tribes knew it as the Full Red Moon because, as the Moon rises, it appears reddish through any sultry haze. It was also called the Green Corn Moon or Grain Moon. •Full Fruit or Barley Moon – August The names Fruit and Barley were reserved only for those years when the Harvest Moon is very late in September. 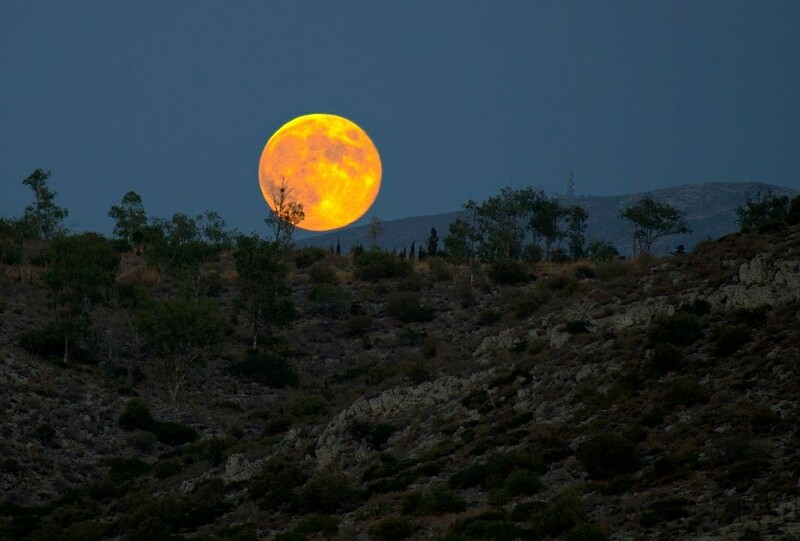 •Full Harvest Moon – September This is the full Moon that occurs closest to the autumn equinox. In two years out of three, the Harvest Moon comes in September, but in some years it occurs in October. At the peak of harvest, farmers can work late into the night by the light of this Moon. Usually the full Moon rises an average of 50 minutes later each night, but for the few nights around the Harvest Moon, the Moon seems to rise at nearly the same time each night: just 25 to 30 minutes later across the U.S., and only 10 to 20 minutes later for much of Canada and Europe. Corn, pumpkins, squash, beans, and wild rice the chief Indian staples are now ready for gathering. • Full Hunter’s Moon – October With the leaves falling and the deer fattened, it is time to hunt. Since the fields have been reaped, hunters can easily see fox and the animals which have come out to glean. •Full Beaver Moon – November This was the time to set beaver traps before the swamps froze, to ensure a supply of warm winter furs. Another interpretation suggests that the name Full Beaver Moon comes from the fact that the beavers are now actively preparing for winter. It is sometimes also referred to as the Frosty Moon.